Maj. Justin Hargrove, 509th Weapons Squadron KC-135 pilot, Fairchild Air Force Base, Wash., wears the coveted United States Weapons School Graduate Patch during Deliberate Strike Night at Nellis Air Force Base, Nev., June 16, 2016. At the conclusion of nearly 400 hours of graduate level academics and combat training missions, the Weapons School course comes climaxes with a week-long exercise known as Advanced Integration. For 68 years, the legacy of the United States Air Force Weapons School at Nellis Air Force Base, Nev., has been to adapt to the current warfare environment in order to produce experts in air power and leaders. 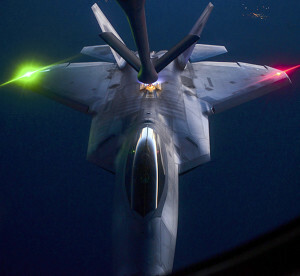 The USAFWS has expanded its integration phases for the 17A class and beyond by focusing on specific lines of operation to create these leaders in the modern era of joint warfare. This change in focus comes directly from Air Force senior leadership whose priority is to make students self-sufficient leaders in all areas of warfare. 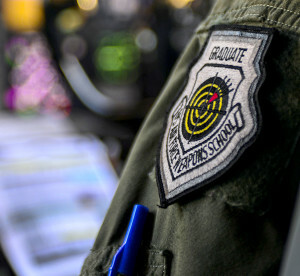 The USAFWS has transformed it method of teaching academics in order to incorporate these priorities into the current Weapons School Integration design. The primary change to the WSINT curriculum is a building block approach utilized to teach student’s skill sets across specific scenarios, and then building upon these skills by incorporating larger and more difficult problems to solve as the course progresses, said Maj. John Walsh, 17th Weapons Squadron chief of integration. The academic structure is much like college programs in which students start at the 100 level and progress to senior-level 400 courses. Instead of having students focus solely on their respective air frames and air power, the new curriculum focuses on joint integration and synchronizing effects across all domains of air, space and cyber space, said Walsh. A KC-135, assigned to the 509th Weapons Squadron, Fairchild Air Force Base, Wash., preforms aerial refueling on an F-22 Raptor, assigned to the 433rd Weapons Squadron, Nellis Air Force Base, Nev., over the Nevada Test and Training Range during the United States Air Force Weapons School’s Deliberate Strike Night, June 16, 2016. DSN is part of the final seven day Advanced Integration portion of the Weapons School curriculum; testing stealth and conventional airframes abilities to conduct attacks during the hours after the sun sets. Allowing students to grasp these overall processes of joint war fighting beyond their own field of expertise offers a broader exposure to students. While the change has been difficult, under the leadership of Col. Michael Drowley, USAFWS commandant, the entire Weapons School has aligned in strategy to create a curriculum that will serve to create experts of air power and leaders for the future of warfare. 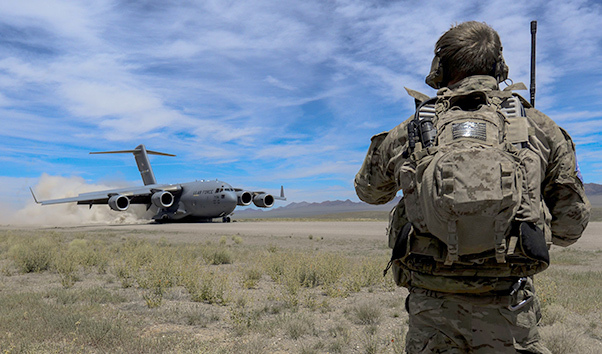 A Combat Controller watches as a C-17 assigned to the 17th Weapons Squadron, Nellis Air Force Base, Nev., lands on an airstrip in the Nevada Test and Training Range during Joint Forcible Entry Exercise, June 16, 2016. The exercise demonstrates the Air Force’s ability to tactically deliver and recover combat forces via air drops and combat landings in a contested environment.